Customize this double link Italian charm with the names of your choice. This double link charm is double the size of a regular charm, with a photo stretched across the base, holding a gorgeous red background and a big, bright pink heart in the center. The two names are etched in white on both sides of the heart. 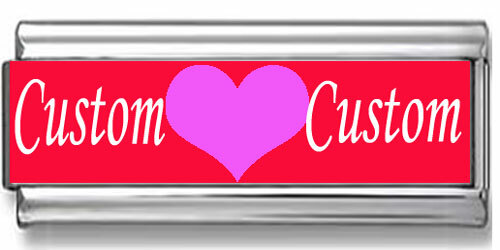 This is a wonderful charm to celebrate your love and devotion to that special someone.